A clash over state mandates prompts aleading Texas school district to declineReading First funding. Though the Texas Education Agency has had great success implementing Reading First in many districts, that doesn’t mean there isn’t an occasional setback. For example, despite its accomplishments with the program, the Southwest Independent School District decided not to apply for second-year funding. “We didn’t apply because we were split with the state on a couple of issues,” says Celanie Dominguez, executive director of Assessment and Accountability for Southwest ISD. Dominguez says the sources of the dispute were a state edict to buy materials the district doesn’t believe it needs, and the requirement that reading coaches work only with teachers and not directly with students. Technology is employed heavily at the state level in two key initiatives of Reading First: Online Teacher Reading Academies and the Campus Leadership Online Community (CLOC). Online Teacher Reading Academies are online professional development courses distributed free on CD to Texas educators, effectively bringing reading academies to teachers’ desktops. The CDs are designed to keep teachers up to date on research-based reading instruction, and include reading academy activities, presentation notes, handouts, videos, and resource materials. In addition, via the Internet, teachers can use the CDs to obtain continuing education credits and current information, including questions asked by their colleagues andanswers provided by academy trainers. Meanwhile, CLOC is a resource developed to provide the state’s RTAs with a Web-based technical assistance site, offering access to information and the expertise of the TRFI partners. Online-related development activities include creatingand disseminating study guides and other programs. More innovation can be seen in Texas’ use of Palm handhelds, breaking new ground by using the devices for reading assessments in schools throughout the state. An estimated 900 schools are currently using a handheld-to- Web version of the state-recommended Texas Primary Reading Inventory (TPRI), an assessment tool used by teachers to obtain an accurate picture of the reading development of students in kindergarten through second grade. Developed by Wireless Generation, the Palm program allows teachers to immediately collect and evaluate Reading First assessment data for each student. Teachers can then promptly target strengths and weaknesses, spot trends, and direct the most appropriate instruction. They can also perform a sync operation to move all of the progress data to a secure Web site, where administrators can view dataand analyze reports. Establishing a clear, definitive direction at the state level with a multipronged, technology-infused approach has helped Texas handle the administrative side of Reading First. But a huge part of the state’s success is owed to its willingness to afford districts flexibility in implementing the program. TEA knew that it needed to allow some slack between the guidelines that the state sets out, and what actually occurs at theschool level. “The school districts have been very open to receiving the assistance, so we’ve been open to letting them drive it and determine what’s best for their student population, as long as it’s aligned with Reading First guidelines,” says Stewart. This openness extends to the use of technology in classrooms. Essentially, it’s up to the individual school districts to decide whether they want to integrate technology into their Reading First efforts. Every Reading First grant submitted to the state is evaluated by a peer review committee that actively looks at what programs are proposed, and decides whether or not they align with the district’s core reading program and meet the scientific research requirements. As long as the technology proposed falls within those guidelines, schools are free to use it. A huge part of the state’s success is owed to itswillingness to give districts flexibility in implementingReading First. TEA knew that it needed to allowsome slack between the state guidelines, and whatactually happens at the school level. Currently, a number of different technologies are being used in Reading First initiatives throughout the state. The majority are being used to support kids struggling with reading concepts rather than to assist core reading instruction, according to Stewart. However, there are exceptions. Grand Prairie Independent School District, for example, uses Achieve Now and Focus from Plato Learning. “We needed a multisensory approach to reading,” says Marva Dixon, director of Curriculum Services at Grand Prairie ISD. Dixon focuses on special education students, and believes in technology’s ability to help close student achievement gaps. Achieve Now addresses the varied needs of students with different learning styles and specific learning disabilities. Students can participate in activities and engage in interactive learning experiences at their own independent learning level. Teachers can also individualize the program for each child and involve families in the learning process. After using the program, the district no longer remediates but rather has to accelerate students. “What we see is a dramatic drop in the number of students qualifying or needing special education services,” Dixon says. The Southwest Independent School District is also integrating technology into its Reading First implementation. The district launched Pearson Digital Learning’s Waterford Early Reading Program, and successfully integrated Waterford with its primary-level reading curriculum. Celanie Dominguez, executive director of Assessment and Accountability for Southwest ISD, reviewed the district’s technology proposal when she first went to work there, but didn’t feel it hit the mark. Dominguez suggested the district examine some additional programs, including Waterford. Southwest ISD adopted the WaterfordEarly Reading Program in 2003.Benefits were seen immediately. Southwest ISD adopted Waterford in 2003, and Dominguez says gains were noticed right away. 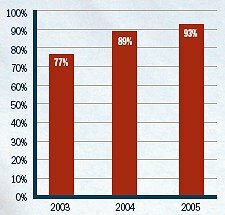 The percentage of Southwest ISD thirdgraders meeting the third-grade reading standard on the Texas Assessment of Knowledge and Skills rose from 77 percent in 2003 to 89 percent in 2004, and to 93 percent in 2005. “The first year we had the highest-gained score in the San Antonio area,” she says. As it moves forward with Reading First, Texas is likely to run into plenty of challenges along the way. But by sticking to a few key guiding principles, the state hopes to keep matters running smoothly betweenitself and the school districts. If we were going to be successful, we needed to approach thison many levels and incorporate those agencies that weremost knowledgeable and skilled in each critical area. TEA also brings all stakeholders together periodically during each school year for training and status checks. “We wantto know where they are now and where they want to go in thecoming year,” says Pritchett. Stewart says that once you’ve set up a support system and listened to the concerns and goals of stakeholders, it’s all a matter of keeping in touch. “The key,” she says, “is constant, constant communication.” She could have been talking about the whole of education. Justine Brown is based in Cool, CA, and specializes in writingabout technology, education, and government.